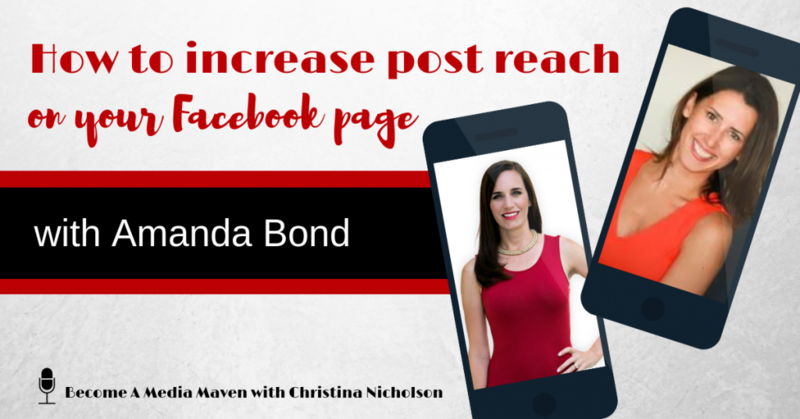 In this episode of Become a Media Maven®, Amanda Bond is showing you how to increase post reach on your Facebook page organically. Yes, without ads! She said when people switch over from there personal profile to the business page, they posting is different. People notice that… and they don’t like it. In the 14th episode, Amanda is going to teach us how to study algorithms, stop looking at vanity metrics, when you should schedule posts… and how you should schedule them. For more on the episode, click here to download it and listen or read what’s below! I am so happy to have Amanda here because one, Facebook is everything. While you are an ads expert, you are also going to help people reach even more people, more of their audience organically, which is amazing. Organic Facebook reach is dead… or are you just doing it wrong? Okay, so let’s get right into that. Here’s the backstory of why people think Facebook is dead and it’s ‘pay to play’ and all of those other fear-mongering tactics that people talk about. These big outlets study millions of pages and then they tell us Facebook reach is dead. Well, what’s happening is they’re studying average, right? They’re looking at the pages that might not be posting or they might not care about their audience or they might be dead. They’re not looking at the people who are truly getting engagement and sharing with us the tips and tactics of how they’re just making these bold industry-wide statements saying it’s dead because of the pool of people that they’re looking at. When I look at the pages that they’re studying, it’s a lot of people who, once they have a Facebook business page, they turn into a spammy marketer. On our personal pages, we know how to be human beings, but as soon as we hop over to our business profile, all of a sudden we think that we need to show up in a different way and we need to be salesy because the goal here is sales transactions, it’s revenue for the business, and it’s those people that act like spammy marketers, posting all the time about “call now to book”, “come into our restaurant”, “do this” and “do that”. ‘On the flip side, we studied 1 million Facebook pages and here’s what we learned.’ Well, why are we studying 1 million average pages? We should be looking at a thousand highly engaged pages and then only do those things because that’s what’s going to get us success organically. When you see people interact on their personal page, they show up one way and then you go over to their business page and you’re like, why is this so promotional? Why is this “click here, do this, buy this, sign up for this Webinar,”? This is what I find so fascinating when you really study how the algorithm works. Facebook values three things. They value community and they value connection and they value conversation. So if you want to rank high in the algorithm, AKA show up in people’s news feeds for free organically, you need to figure out how to build community on your Facebook page and you do that through connection with people, really caring about your audience and then encouraging them to show up to your Facebook page and engage in the conversation. And I know that everyone who’s listening knows how to do this because a lot of you already have Facebook groups, right? Think of that back and forth conversation that goes down in Facebook groups. We know how to have a conversation. The thing is we’re just not doing it on our pages. If you have a thousand people in your Facebook group and you post something, the max number of people who are going to see that post is a thousand, right? If you don’t have a thousand and one group member has a thousand, but if you posted that exact same content over on your Facebook page and cultivated that community and facilitated that back and forth conversation, your reach potential is infinite because as people come and engage on your content, as people like comment, share, click, they’re sending all these signals back to the Facebook algorithm. You’re already doing it in a Facebook group. Now, it’s time to bring it over and do that on your Facebook page and the way you just described that it really is a lot like media pitching. To get coverage, they act spammy and they’re overly promotional to the point that it’s so salesy that nobody cares. If they were actually trying to help the journalists and do a story and be more relatable, it would work. It’s about building that human connection with people. I feel like the industry took a weird turn a few years ago when it became all about numbers. Numbers this and email lists that and grow your audience and then sell them something. It needs to get back to the foundational elements of marketing which is nurturing your potential customers, building relationships with these people. Relationships don’t have to necessarily be one to one, but investing in your audience, investing in the humans behind the screen that you can serve with your product or service because your product or service can create a transformation in their lives. If we think about them like numbers on a spreadsheet or like emails in our email list, we’re doing ourselves a disservice. But if we think about them as human beings trying to navigate their own life and lifestyle and business, then we can show up in a service-based way where we care about that community. It gets easier to build community when you care and that’s when people start really paying attention to us, our brand, and our offers because we understand those that we’re trying to serve. Are there any other Facebook pages that you really like the way are posting to get that organic reach? I’m seeing a fun transition from Social Media Examiner. They used to post a lot of direct links to their blog and the traffic from Facebook was decreasing dramatically over the years and so I’m enjoying watching them switch things up and experiment with new formats and really paying attention to what their audience is doing. So I would check out Social Media Examiner’s Facebook page just to continue to watch that evolution because I love seeing people in the progress, not perfection. I love seeing people try new things and take risks along the way because it’s not about showing up absolutely perfect, but it’s about doing the little improvements day in and day out with Facebook. There are myths on not just scheduling and then posting in real time, but what kind of scheduler are you using? So dish on that. This is so controversial. It really is. In the social media game, schedulers are controversial because on one hand you have the tracking ability and you have the ease that a lot of people who manage multiple accounts are looking for. Those recyclers who just take the content and post it over and over again in a certain frequency, that’s attractive when you’re managing many different Facebook ad accounts or different social media accounts like Twitter and Pinterest and all of the things that you need to manage, so they’re attractive because we feel like we’re going to get more information from them and it’s going to make our lives easier. However, this is something that’s never been proven. Facebook says using third-party tools doesn’t lower your reach, but I find personally when people use third party tools to schedule they’re checking out of the analysis process. If you set it and forget it, you might be putting out bomb content and you’re getting people fired up, but if you’ve set and forgot… that’s definitely not how you say that. It doesn’t rhyme. If you set and forget your social media, then what happens is you’re going to forget to go back and interact and create that conversation and create that connection and create that community because you don’t know what’s coming down the pipeline or when. So there might not be true data that says, “Hey, if you use a third-party scheduler, you’re going to have less reach,” but this is the mindset behind it. If you’re using a third-party scheduler, you’re usually getting less reach because you’ve checked out of that process. So I do recommend that people, especially on Facebook, I have a different opinion on Instagram, but especially on Facebook. I recommend if you are going to schedule posts, definitely use their native scheduler and don’t schedule it out months in advance. Keep a watch on the platform. Stay engaged on the platform that you use to connect with your audience. I’m a big believer in using fewer platforms. So you might need a scheduler to be on Twitter and Pinterest and Facebook and Instagram, but you don’t need a scheduler if you doubled down on Facebook and really go strong at building a community there and just posting when you feel inspired or when it’s in alignment with your business objectives and not in a spammy way, not in a salesy way, but in an engagement driven way to build that community up. So is there a guide that you would suggest as far as how often to post? Should you be looking to do one a day, two a day, maybe one every other day? Does that matter in the algorithm? It doesn’t matter for the algorithm. Where it does matter is your personality. So let’s use you and I, for example, you might enjoy scheduling something in advance with consistency and predictability because maybe that’s how your business operates. On the flip side, I might enjoy being a little bit more sporadic. I enjoy posting when inspiration comes, I don’t enjoy sitting down and saying, ‘what are the things that I’m going to post this month all in one day?’. I know batching content is amazing for some people, but if that’s not your personality, that’s okay too, so there is no algorithmic benefit of us posting daily or posting on a sporadic schedule. Where the algorithm comes into play is how much engagement each and every post can get. So engagement means Facebook likes and reactions, shares, comments, how many people are clicking, how many people are taking action on your post to then say every time they take an action, etc. That’s a signal to the algorithm that your content is relevant. 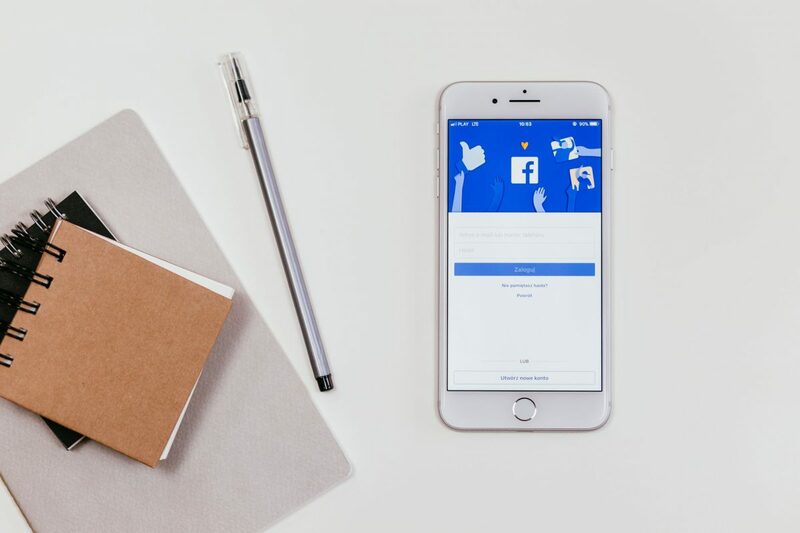 When you post something new and let’s say you’re doing it manually, Facebook is going to test the waters to see how engaging your content is and if it is engaging, this is how you win the battle. If it’s engaging, they’re going to serve it to a few more people. If they continue to engage guests, what you’re winning, they are going to keep showing people your content, but on the flip side, if you post something and there’s no engagement, no reactions, no comments, no shares, no clicks, no nothing, Facebook is going to determine that your content isn’t relevant and they’re going to stop serving it, and that’s where people think Facebook reaches a dead because they don’t look at that and say, now let’s analyze why that didn’t get engagement. Maybe let’s delete this one, which I personally do on my page. If I get really bad engagement, I’m going to delete it. I’m going to reword it. I’m going to turn it into an image. I’m going to do a live stream instead on it. Same content, same concept, the same end goal, but I’m just going to try and see what resonates with my audience more and if they start engaging with that content format, Ding, Ding, Ding. We now understand the format that people need to start treating your page more like a community and start to slowly put their hands up and engage in conversation with you and once you crack that nut, once you have the formula for getting engagement, that’s when your reach blows up. So instead of scheduling stuff and then not caring about the engagement on each individual post, I say post way less with intention and then go back and analyze whether this is resonating with my audience. Even if you only have a small 50 person page, are people putting their hands up? If 10 people are reached, is one person clicking? I want for every 10 people that post heads one or two people taking action consistently and if not we need to just go back and analyze our content to see why. Once we start running ads, this helps us to lower our ad costs dramatically. Once we understand what our audience engages with. And I want to get into that because you spent less than a thousand dollars on ads on one of your courses and brought in over $100,000. I get so fired up about this because you spent less than a thousand dollars on ads and brought in over 100,000. You think that we should be blowing things up with Facebook ads. However, I’m the first person to tell people to pump the brakes. You’re not ready for Facebook ads. And the reason that I say that is because most people, they are using Facebook ads to grow audiences before they ever have something that sells or something that can sell over and over again with consistency, without the use of broad marketing scarcity tactics like timers and deadlines and price discounts. If you understand the value that your product or service brings to the world and you can effectively communicate that value in your messaging and get people to make a purchase, that is the thing that’s going to bring you Facebook advertising success because Facebook ads are only going to amplify what’s broken and if you can’t sell spending money on Facebook ads is going to be like giving the ATM a 20 dollar bill and the ATM just shredding it. So your ATM is actually a paper shredder. It’s not an investment vehicle if you cannot sell because ads, as I said, just amplify what’s broken. So I always recommend people slow down when it comes to ads. They’re not a magic bullet. They’re going to lose you so much money if you do it crazy fast or too soon in your business. What I do recommend is people understand the offer, that they understand the transformation that it helps people to achieve, and then they work on the sales process first. So in the example that you just said, the over $100,000 in sales on less than a thousand. We sold, get this, the first $40,000 of the program in messenger. I kid you not. So I just used the people that were in my networks, I went back to traditional networking, marketing foundation. Wait you actually talked to people? I got into one on one conversations with people where all I wanted to do was connect with people. There was no agenda. I was not trying to sell them my program and I would not talk about the program if they didn’t give me an indicator in that conversation that it’s something that they needed. If in the conversation when I was asking them open-ended questions about them, their life, how things are going, if they volunteered information saying, ‘hey, we’re really struggling with x and I knew that my offer could help them solve y’, then I would have conversations with only those people and I ended up at the end of the day having over 200 sales conversations with people and out of those 200 people we had 20 people buy, but it wasn’t the 20 people that bought the $2,000 offer at that time. It was the insight that came from all of those conversations. Most people don’t get that insight, so when they start with Facebook ads, when they start trying to build a Facebook page, when they start trying to get an audience and engage with them, when they start trying to pitch media outlets, they don’t understand what makes them unique or what people actually need and so they sound like spam. If you have true conversations with your audience, belly to belly, get on zoom, have them in messenger, get on the phone for crying out loud and ask them open-ended questions. They are going to be an open book and they’re going to give you the exact copy that you’ll need to have success. So I kid you not, we had all of these sales conversations and as I was having them, I was writing down their exact words in my notes or on my clipboard. Yes, I use a clipboard and then I plug it into Google docs and I handed them back a Google doc of verbatim their own wording as to why they needed the offer that I had and I said, would you like to buy this? And that has made all the difference, so now when somebody opts into what we offer… we actually don’t have any lead magnets in our business. We have a waitlist for the program, so there are no freebies that we offer. I love to connect with people and add value on my Facebook page, on podcasts, but when you come to our site, we just get straight to the point. Here’s how we can help you create the transformation that you’re looking for in your business through ads and get industry rates for sales. Conversions on sales funnels are like one percent, two percent, three percent. If you’re lucky, on evergreen, ours convert at 10 percent when you opt in with no timers, no deadlines, after I stop emailing you about it, you can still join at any given time because we’ve taken the time to know our audience so intimately so we treat each and every ad, each and every post as here we are talking to our customers. It’s not if you’re going to buy our product. It’s when you’re going to buy our product and we’re still showing up and adding value every step of the way because I don’t care if you buy today, if you buy 10 years from now, if you never buy, but you’re still an active part of the community. I value each and every one of those humans all the same. Can I just say as somebody who has dabbled in online business, first of all, it’s just hard, in general, to sell something online for a few hundred dollars. The fact that you were selling a $2,000 product directly online is insane. It took a lot of effort and I think that’s what’s missing from a lot of the expert industry is just being honest. That hard work pays off. I’m not talking to the hustle element. I’m talking about consistently taking actions towards our goals, focused actions on the right things pays off, but it does take time. Like, I’ve been trying to perfect the community and engagement on my Facebook page for over four years now and we still haven’t even gotten to 10,000 page likes and I’m okay with that because our audience shows up big when reach is less than 10 percent and engagement industry-wide is less than one to three percent. When our page has 20 percent engagement, I am just so fired up because that means that people care because that means that people are getting enough value to stick around and then from a business perspective, that means that our audience is growing, which means we can retarget more people with our ads in the future as we scale. So most people say my email list is only so big and I can just target those people as my warm audience, but the cool thing is Facebook allows us to target anyone who watched a video for at least three seconds on our Facebook business page and our Instagram business profile and anyone who engaged on your Facebook business page, so people who are reacting or commenting, sharing, clicking, those people are now in our audiences that we can put ads in front of, doesn’t it make sense to have a really great relationship with those people so that when you do offer them something, they’re more likely to take it up? My email list was less than 2,000 people before or by the time we hit half a million dollars in sales, so it doesn’t have to be like grow this gangbuster big list. It’s go deep, nail the basics, learn to sell, and then create the systems to then sell that over and over again through connection, engagement, and the right tools like Facebook ads and organic posts and media. We’ve hit $100,000 in sales on the program over a year and I am so okay with that slow burn because it allows you to put the foundations in place without wanting to pull your hair out and now that you have those foundations we get excited about, you know, media. You and I were chatting about that because sure we could do it organically on our Facebook page and bring more people into our warm audiences or we could leverage other people’s platforms and get our name out there in a bigger way through PR and media and leverage. And then, we can use ads not to bring in cold traffic because let me tell you, the cost to advertise has drastically been increasing over the years. It’s like three to five times more expensive for a lead than it was in 2016. So you could do cold traffic to ads or you could be using ads to move people through a customer journey. Once they reach you from leveraging other people’s audiences, from media placements, from connecting with people organically on different social channels, and then once they have expressed interest in your brand, then you can just nudge them closer to your products and services because they’ve already put their hand up and said, “I like what you’re throwing down. I want to do business with you”. What you mentioned about using all of the media, I tell people there are three kinds of media. There’s owned which is you posting on your page. There’s earned which is earning that exposure in the media on somebody else’s media platform and then there are ads where you’re actually paying for the coverage and in a perfect world you’re going to have all three, but you do need to start slowly with one and then slowly work your way up. Yes, don’t diversify your attention, right? Your attention-getting strategies. Don’t try and be everywhere all at once. Go deep with whatever you’re focused on in that moment. If you’re listening and you are slaying it on Instagram and the next thing that you’re looking for is earned media. Do not abandon ship and go over to Facebook just because I told you that Facebook reach isn’t dead. Go deep, get strategic, make one platform work for you, and then go to a second one and own the crap out of your strategy there and then once those things are working, can we double down on these two? Could we accelerate these two or do we need a third one to diversify a little bit more, but again, the name of the game is patience because if you have patience in this business, you will outlast so many shiny object seekers. It’s not even funny, right? We see this. I’ve been in this industry for long enough that you see people come, they ramp up and then they disappear off the face of the earth because they tried to do too much, too fast, without depth, so please, if you’re listening, be that person who seeks depth.